Oh my, I am worn out!! 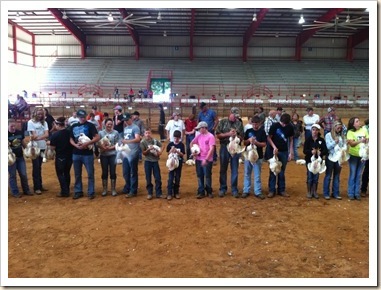 This week we have been participating in the Henderson County Live Stock Show! It has been a lot of work, a lot of fun, and very rewarding! We participated in the Project Show – each child signed up for a project (weaving, wood work, necklace, etc) and a food project. We got all the food done and in, but not all the other stuff. 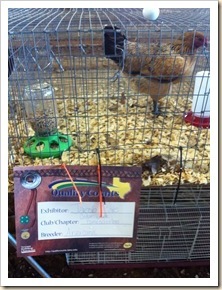 So J earned a Blue Ribbon for his Jelly – and P earned 2 Red Ribbons : 1 for a cake and 1 for a paracord key chain. E and A earned participation ribbons for their food and projects. Overall Fun! Next was the Broiler Show. 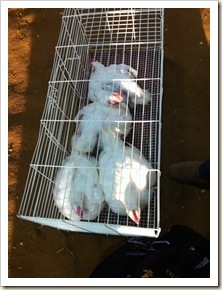 If you remember, about 6 weeks ago our broilers arrived (about 2 days old) and grew up quickly. We had friends help us with several aspects, and we decided to try to implement some of what we learned last year. So when a friend of a friend showed up Thursday night to help us pick our birds – I was a bit dejected. He said they were okay, but we had a lot of improvements to make. He said what we were doing was not enough. Bummer. 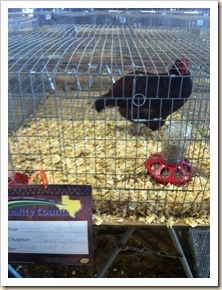 However, upon arrival at the show, we noticed many pens of scrawny birds and got some confidence back! We were cut in the first group last time, but this time not until the 3rd cut!! That was my show goal – make the second cut!! We were right smack in the middle of the 52 pens what were shown. So about 23 were better and the rest were not! So we were so thrilled! Next year we are trying again! I think we might do 3 pens – 1 per boy. And we will apply even more of the tips we heard from friends! 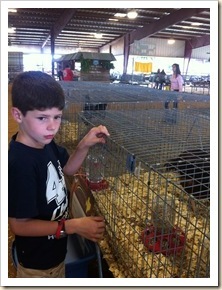 the day of the show, and going to be late after giving 8 chickens bubble baths (not to mention blow drying them) – it was all worth it when we made it as far as we did with our chickens! It was worth it. 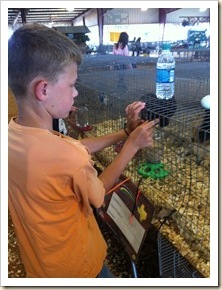 Here are the boys checking on their breeding hens too – both chose one to show – did not win, but participated! 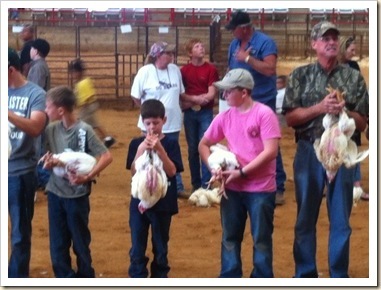 Here they are again, showing chickens – the pink shirt boy is a friend who helped, and the two to the left of him are my boys! Tomorrow we get up early and butcher as many as we can before Robert takes the big boys to the District Rifle Competition and the younger ones go with me back to the Stock Show – they get to show a pig and rabbit in the PeeWee show. Overall, will be a great week! !